From a 17-year cohort study, we obtained detailed data from approximately 51,000 children and their caregivers, explored the factors associated with children’s healthy development, and developed five tools. We also created an instruction manual in order to better apply the results in practice. By application of the five supporting tools and design, it is possible to develop “evidence-based practice”?namely, making flexible use of support loops such as “precise practice,” “evaluation,” and “utilizing feedback to improve practice,” based on “identifying the true needs of children and their caregivers.” In addition, we can understand which children require special needs education earlier, continuously implement high-quality support cooperatively with other organizations, and evaluate this support. The five tools are introduced as follows. ※You can download the paper-based tools from the “Download the tools” page. ※You can refer to the WEB version by clicking the “Childcare supporting system” link at the bottom of the SITE MENU page. We adopted the most popular items from familiar developmental screening tests such as the Enjyouji version of the Infants and Toddlers Developmental Analysis Screening Test, the Denver Developmental Screening Test, and the Kyoto Scale of Psychological Development 2001; after consultation with many childcare professionals, we revised the items that childcare professionals could evaluate and be arranged by the age of children (in months) they apply to. For children under seven years old, we divided it in to three subscales: “motor development,” “social skills development,” and “language development.” Each subscale has two sub-dimensions. This tool provides a general, objective assessment of children. This scale is intended for preschool-age children and can measure individual differences in social skills. It contains three factors repeatedly identified as important in previous studies: cooperation, self-control, and assertion. It has shown high internal consistency and temporal stability. Moreover, its concurrent and predictive validity have been confirmed. In order to generally understand children and ensure whether childcare support is necessary, we developed this scale according to childcare professionals’ practical working experience. It contains 33 items; in each item, the underlying factor can be checked. This scale includes 13 items, grouped into four subscales: “human stimulation,” “social stimulation,” “avoidance of restriction,” and “social support.” It is intended for the caregivers who have 0- to 6-year-old children. The items and subscales were based on the HOME (Home Observation for Measurement of the Environment). According to a home visit investigation in Japan, it showed a high correlation with the HOME and good predictive validity for future development and behavioral problems. This index was developed to “empower professionals” and support “a variety of childcare needs.” In order to achieve the goal of “optimal benefits for children,” we developed items utilizing information on the variety of needs of children and caregivers. It is an effective self-evaluation tool that can be applied to improve the quality of daily childcare. Even though the 5 evidence-based tools can be used separately for the purpose of “optimal benefits for children,” it is recommended that they be used in conjunction to provide general childcare and childcare support. 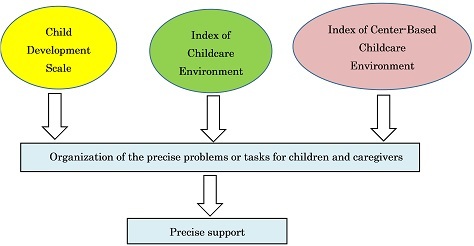 For example, in a study on child extended care in a nursery entitled “The influence on infant’s and toddlers’ development of long time childcare − A five- year cohort study,” the development scales (Child Development Scale, Social Skill Scale, and Checklist for Children with Difficulties) and the Index of Childcare Environment were used concurrently. This study was widely introduced by mass media and was even highly recommended as objective research by the Ministry of Health, Labor and Welfare. Moreover, with the application of the Index of Center-Based Childcare Environment, we can confirm practical items to offer “high-quality childcare service.” For example, depending on access to staff training, it is possible to offer less variance quality of support between new staff and core staff. In childcare implementation, childcare professionals make direct contact with children’s development and may experience various difficulties. It is necessary to improve professionals’ skill in looking at the current situation objectively and always examine better plans for support. P PLAN Set up a goal, and make a plan along with your goal. D DO Implement the plan. C CHECK Confirm the result, and make a evaluation. 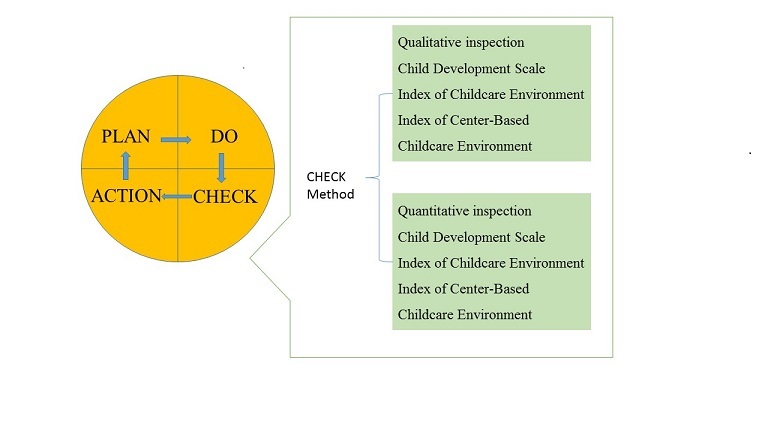 The development scales (i.e., the Child Development Scale, Social Skill Scale, and Checklist for Children with Difficulties), the Index of Childcare Environment, and Index of Center-Based Childcare Environment can be used both as qualitative inspection (recording daily life) and quantitative inspection (compared with nationwide data). By combining these inspections, the likelihood of implementing effective support will surely increase. These are paper version tools. Copyright (C) Childcare Power Up All rights reserved.